(264) Upload (3/28/2019/MMM): Version 2019.3.28 uploaded to the RockWare website. (263) Bug Fix (3/28/2019/MIW): When using the Custom Units per Page option in LogView the Lithology Description and Interval Text columns weren't being clipped correctly. (262) Bug Fix (3/27/2019/MIW): Importing LogPlot 7 data files was only bringing in 1 line of Note Text data. (261) Enhancement (3/14/2019/JCJ): The LAS Import better maps LAS data fields and the LP data fields. (260) Enhancement (3/14/2019/JCJ): LAS parameter data is imported to Edit text on a tab named after the data section. (259) Enhancement (3/14/2019/JCJ): Tabs with two depths (like Lithology; with a Top and Base depth) both fields are auto mapped. (258) Upload (2/28/2019/MIW): Revision 2018.2.28 uploaded to the RockWare website. (257) Bug fix (2/14/2019/MIW): Made a possible fix for very intermittent Access Violations when switching away from the LogPlot Pattern Picker to another program and then returning. (256) Bug fix (2/11/2019/MIW): The LogDesigner now works with the arrow keys to move the selected items. (255) Bug fix (2/8/2019/MIW): Well Construction items with the inner and outer diameters equal weren't plotting. (254) Bug fix (2/8/2019/MIW): When importing a LogPlot 7 Desisgn File the Vertical Text Fill Background property now converts the background color to transparent white. (253) Bug fix (2/4/2019/MIW): The Delete key in the LogDesigner works more reliably. (252) Upload (01/31/2019/MIW): Revision 2019.1.31 uploaded to the RockWare website. (251) Enhancement (01/24/2019/MIW): Importing older pattern files now sets the imported file as the default library. (250) Enhancement (01/23/2019/MIW): An option to Show Data Load/Import warnings has been added to the System Settings. This option applies to Excel and AGS imports as well as loading Logplot data files. It is set to true by default. (249) New Feature (01/21/2019/JCJ): LAS version 3 import capability added. This version will import versions 1.2 and 2 of LAS files also. (248) Bug Fix (01/18/2019/MIW): The line width for Block style curves is now adjusted for the resolution of the output device. (247) Bug Fix (01/17/2019/MIW): The Excel Import now handles optional fields for Horizontal Lines correctly. (246) Bug Fix (01/17/2019/MIW): The Excel Import no longer combines all Point Text into one table. (245) Upload (12/27/2018/MMM): Revision 2018.12.27 uploaded to the RockWare website. (244) Improvement (12/20/2018/MIW): Added an option for Cross Plots to truncate values to the minimum and maximum values. (243) Bug Fix (12/19/2018/MIW): The Color Table name was not being saved in the Bargraph Setup dialog. (242) Upload (12/03/2018/MMM): Uploaded version 2018.12.3 to the website. (241) Bug Fix (12/03/2018/JCJ): Fixed a problem in which validation of unlocking codes was preventing license activation. (240) Improvement (11/29/2018/MIW): Users can now switch between tabsheets (Log Designer, Data Editor and Log View) by pressing Control and the number of the page. (239) Bug Fix (11/28/2018/MIW): In the LogPlot8 Data Editor, pressing the numeric keypad's '0' in a Text type column no longer causes the editor to appear. (238) Improvement (11/16/2018/MIW): In addition to new items added to a log design, moving existing items within the log design will be snapped to the closest grid point if Snap is turned on. Rectangular header objects will snap based on their top-left corner, static and edit text will snap based on their origin, and body objects will snap based on their left edge. (237) Improvement (10/31/2018/MIW): Text in a Vertical Text object can now be Left or Right Justified as well as Centered. (236) Bug Fix (10/17/2018/MIW): Pattern borders were being draw 1 pixel short of their correct location. (235) Bug Fix (10/17/2018/MIW): Pattern border line widths weren't being scaled to the output resolution. (234) Bug Fix (10/15/2018/MIW): The drawing of some column baselines in compiled logs were off by 1 pixel. (233) Improvement (10/15/2018/MIW): Added options in System Settings for saving backups of Log Designer files (.ldfx8) to a custom location or not to save backups at all (not recommended). (232) Improvement (10/15/2018/MIW): Speeded up the saving of Log Design files (.ldfx8). (231) Improvement (10/15/2018/MIW): The status bar in the Log Designer now maximizes the display of the current filename depending on the window width. (230) New Feature (10/03/2018/MIW): Users can now select and delete multiple files from the Project Manager. (229) New Feature (10/03/2018/MIW): Users can select and rename files from the Project Manager. (228) Bug fix (9/13/2018/MIW): The Vertical Text column could not be displayed with transparency on a printer and has been modified so that the text is never transparent but the remainder of the interval is. (227) Bug fix (9/10/18/MIW): Removed the Clear Type Natural option for antialiasing, it caused wrapped text to plot past the boundaries. (226) Bug fix (9/10/18/MIW): Scalebars set for TVD now clip labels and tickmarks below the Total Depth. (224) Improvement (9/6/18/MIW): Increased the accuracy of the TVD Scalebar. (223) Improvement (9/6/18/MIW): Improved lithology description clipping at the top of the page and long descriptions at the bottom of the page. (222) Bug fix (9/6/18/MIW): Tweaked some page clipping issues which appeared with the improvement of lithology and well construction offsets. (221) Bug fix (9/6/18/MIW): Fixed an issue with overlapping Lith Descriptions when compiled with page breaks. (220) Bug fix (9/5/18/MIW): Fixed some graphical errors in related to clipping and plotting at the top of the log body which appeared with the improvement of lithology and well construction offsets. (219) Bug fix (8/10/18/MIW): Lithology Descriptions and Well Construction Descriptions whose offsets exceeded past the bottom of the last page now cause the program to add additional pages as needed. (218) Improvement (8/9/18/MIW): Added an option to switch Font Quality to: Non-Antialiased (current), Antialiased, Clear Tyoe or Clear Type Natural. Clear Type and Clear Type Natural provide better antialiasing then the Windows standard antialiasing. (217) Bug fix (8/6/18/MIW): When Importing a Design Template from LogPlot 2005 or older it now creates temporary file in the current Project Folder rather than the folder where the imported file resides. (216) Bug fix (8/6/18/MIW): When Importing a Design Template from LogPlot 2005 or older the page sizes were not being correctly imported. (215) Improvement (8/6/18/MIW): When saving a LogPlot 8 Data Template it now populates the filename based on the current Design Template. (214) Improvement (8/6/18/MIW): When LogPlot8 loads a Design Template it now looks for a Data Template file (.ldatx) with the same name and uses that to create an empty data file. (213) Bug fix (7/27/18/MIW): The Break Curve option was always being set on in the LogDesigner Curve dialog. (212) Improvement (7/20/18/MIW): Users can now hide the interval error messages from the compile dialog. (211) Improvement (7/20/18/MIW): An interval check has been added to all interval data at compile time. The interval check tests for swapped intervals and intervals with 0 height. Users can choose to swap depth values or ignore then interval for each line or for all lines. Zero height intervals will be skipped. (210) Bug fix (7/19/18/MIW): Lithology Patterns are now skipped if the interval is less than or equal to zero. (209) Improvement (7/10/18/MIW): A Smoothing option has been added to Cross Plots and Curves. (208) Improvement (6/15/18/MIW): Added an option to modify the fonts for all selected items in the LogDesigner. This option can be accessed from the popup menu or under the Edit menu. (207) Bug fix (6/13/18/MIW): Users can no longer enter LAS Output file names by typing directly into the filename edit box. This avoids having files go to invalid or incorrect folders. (206) Bug fix (05/18/18/MIW): In the Data Sheet you no longer get an Access Violation attempting to type right after inserting new rows. (205) Bug fix (05/18/18/MIW): In the Data Sheet you no longer get an Access Violation attempting to type right after inserting new rows. (204) New Feature (05/18/18/MIW): The LogView window now has a Go To Page (Ctrl+G) option. (203) Improvement (04/26/18/MIW): The LAS Export now includes Edit-Notes which are added to the Parameters section. Line feeds in the Edit-Notes are converted to spaces. (202) Improvement (04/26/18/MIW): In the LAS Export Edit-Text/Notes without data are no longer displayed in the Export dialog or included . (201) Bug Fix (04/26/18/MIW): The Data Editor multi-cell selection now works correctly after editing a cell. (200) Bug Fix (04/25/18/MIW): The Data Editors Column Filter now replaces filtered values with an empty space instead of the filter value. (199) Bug Fix (04/19/18/MIW): The Symbol Selector dialog now sets the correct page, symbol and colors when for raster symbols. (198) Improvement (04/18/18/MIW): New bitmap symbols have been added. (197) Bug Fix (04/18/18/MIW): Exporting PDF and printing logs that contain bitmap columns has been improved. (196) Improvement (04/13/18/MIW): Improvements have been made to the plotting of the Bitmap Column to improve speed and memory usage. In addition more logic is now applied to deciding which bitmaps to not draw. (195) Improvement (04/13/18/MIW): The cursor is now changed to an hourglass when drawing to the screen, compiling logs and loading or saving compiled logs. (194) Improvement (04/12/18/MIW): A pull-down button has been added to the caption bars within the LogView, LogDesign and Data Editor windows. When clicked, this button will dock the floating window to the main menu. (193) Bug Fix (04/11/18/MIW): The last lithology description with a log is now completely plotted. (192) Bug Fix (04/11/18/MIW): Incorrectly linked images are no longer plotted on page 2 (or greater). (191) Bug Fix (04/04/18/MIW): Comments within the Data Editor that are only one line now plot correctly. (190) Bug Fix (04/04/18/MIW): Exporting to PDF or bitmaps when the screen resolution is greater than 96dpi no longer generates font sizes that are too large. (189) Bug Fix (04/04/18/MIW): Lithology descriptions that exceed two pages are now adjusted properly. (188) Improvement (03/30/18/MIW): Well construction labels on the last page of the log will now be moved upward if they are below the bottom of the log. (187) Improvement (03/29/18/MIW): Well construction descriptions and lines are now clipped to the bottom of the page instead of the total depth of the log. (186) Improvement (03/29/18/MIW): Well construction descriptions are no longer offset vertically with excessive margins. (185) Bug Fix (03/28/18/MIW): The Water Level symbol is no longer always filled. (185) Enhancement (03/28/18/MIW): Horizontally-centered text within Text Columns no longer behaves erratically if the text contains line-feed characters. (184) Improvement (03/23/18/JCJ): Error trapping within the Excel import utility has been improved. (183) Enhancement (03/08/18/MIW): When exporting data, any LAS file depths outside the data depth range will be assigned a null value. (182) New Feature (03/08/18/MIW): The Vertical Text option now has a setting to designate the background as transparent. (181) Enhancement (03/08/18/MIW): Vertical text with a white background is now transparent. (180) Bug Fix (02/22/18/MIW): Curve Legends are now drawn correctly. (179) Bug Fix (02/09/18/MIW): The color button dialog no longer returns invalid colors if the user chooses a custom color. (178) Enhancement (02/09/18/MIW): All of the color buttons in LogPlot now save and load the custom colors from the color dialog. (177) Improvement (02/07/18/JCJ): Regional settings no longer concatenate decimal numbers. (176) Improvement (02/01/18/MIW): Fine tuned the placement of Lithology Descriptions that overlapped page tops and bottoms. (175) Improvement (02/01/18/MIW): Interval text no longer overlaps the page top and bottom for Center and Bottom Alignment. (174) Bug Fix (01/04/18/MIW): The Excel, DBF, Text and AGS Import dialogs now display correctly on Windows 7 computers set for large fonts. (173) Bug Fix (12/13/17): Interval Text with margins larger than the interval are now plotted. (172) Bug Fix (12/13/17): Missing Keywords no longer cause an Index Out of Bounds error. (155) Enhancement (11/10/17/MIW): Header Legends imported from LogPlot 7 were being drawn with some overlap if they had very little vertical space between the titles. (149) Bug Fix (10/20/17/MIW): The height of Comments within the Lithology Description was being increased by one line. This caused extra space below the comment. (148) Bug Fix (10/18/17/MIW): Contact lines for Lithology Descriptions weren't matching the correct intervals on pages after the first page. (147) Bug Fix (10/18/17/MIW): Raster Exports at a resolution evenly divided by the screen resolution caused an Assertion Error. (146) Bug Fix (10/16/17/MIW): Exporting a log at an output resolution that is an exact multiplier of the screen resolution (e.g. 288 divided by 96) no longer triggers an "assertion exception". (145) New Feature (10/09/17/MIW): An option has been added to force the program to draw column top and base lines for Lithology Description, Lithology Pattern, Interval Text, Point Text and Well Construction Columns. (144) Bug Fix (10/06/17/MIW): Fixes a double plotting problem with the Lith Description when the interval extended over 2 or more pages but the text fit on the first page. (143) Improvement (10/06/17/MIW): Draws Column bottoms for Text Column. (142) Bug Fix (10/06/17/MIW): Fixes description overplots. (141) Bug Fix (10/06/17/MIW): Comments in the Lithology Description column could cause items below to be offset even when not needed. (140) Bug Fix (10/06/17/MIW): The last entry in the Lithology Description model wouldn't display the base of the interval line when the description spanned 2 or more pages. (138) Bug Fix (09/08/17/MIW): When importing from a Multisheet Excel file the Well Construction Inner and Outer dimensions were swapped. (137) New Feature (08/16/17/MIW): The Fracture column can now be set to use dip-from-vertical measurements. (137) New Feature (08/16/17/MIW): The Fracture column can now be set to use dip from vertical measurements. (136) Bug Fix (08/10/17/MIW): Lithology descriptions are no longer duplicated when Offset Description are enabled and the data contains many small intervals with long descriptions. (135) Cosmetic (07/31/17/MIW): The Save As option within the Log Designer no longer includes an invalid option for the saving to a LogPlot7 format. (134) New Feature (07/19/17/MIW): A error message will now be displayed if the Vertical Text Top Depths are lower than the Base Depths or intervals with heights of zero. This will avoid errors within the display. (133) New Feature (07/12/17/MIW): An option has been added for plotting a border around each Vertical Text interval. (132) Bug Fix (07/12/17/MIW): Vertical Text data is now saved in the editor if the Text value is empty. (131) Bug Fix (07/12/17/MIW): Vertical Text is now plotted if the Text Value is empty. (130) Bug Fix (07/12/17/MIW): The Vertical Text frame column now plots consistently. (129) Bug Fix (06/19/17/MIW): The Excel Template export no longer includes the data. (128) Bug Fix (06/15/17/MIW): I-Text is now vertically centered. (127) Bug Fix (6/15/17/MIW): I-Text no longer sporadically overplots adjacent entries when automatic offsets are enabled. (126) Bug Fix (6/15/17/MIW): Scalebars with a conversion factor no longer draw tick-marks and labels in the wrong direction. (125) Bug Fix (6/15/17/MIW): Text font sizes are no longer being reduced when plotted at high resolutions to avoid long lines from stretching. Now, only the Edit and Static Text font sizes are reduced. (124) Improvement (06/14/17/JCJ): The program will now “trap” and disable project folder monitoring (DirMon) if the user does not have sufficient rights. (123) Improvement (06/14/17/JCJ): In order to facilitate administrators who are having problems when overriding the data folder, LogPlot will now use the HKCU entry for UsrData – if it exists. Otherwise, LogPlot will read HKLM and look for an tntry like the user Document’s folder and replace whatever is there with the current user. For instance, if the key in HKLM is C:\Users\Administrator\Documents\LogPlot8 Data it will parse it and change it to, for C:\Users\Jim Jackson\Documents\LogPlot8 Data and then save it to HKCU for next time. Note: With Lp8SetNetworkPath an administrator can also set the value to: %UserProfile%\Documents\LogPlot8 Data\ for their users. (122) Bug Fix (05/31/17/MIW): In the LogDesigner, Undoing the deletion of a Header Picture didn't restore the graphic. (121) Bug Fix (05/26/17/MIW): In the LogDesigner the location rectangles that were displayed when moving an item were offset when either the vertical or horizontal scroll bars were scrolled. (120) Improvement (05/16/17/MIW): Incorrectly entered data for Scalebar Surveys still plots. (119) Cosmetic (05/15/17/MIW): Changed the Scale Bar Survey Type choices for Depth and Absolute Depth to Negative Depth and Positive Depth. (118) Bug Fix (05/15/17/MIW): Scale Bar Surveys that end pointing up could cause the program to go into an infinite loop. (117) New Feature (05/16/17/MIW): Incorrectly entered data for Scalebar Surveys still plots. (116) New Feature (05/08/17/MIW): The user can now specify the number of units per page to display on the compiled log. (115) Bug Fix (05/05/17/MIW): Fixed a Scalebar problem with multiple downward orientations. (114) Bug Fix (05/04/17/MIW): Inclined boreholes that angled upward didn't calculate elevations correctly. (113) Bug Fix (05/16/17/MIW): Deviated boreholes that had KB lower than the TD didn't calculate elevations correctly. (112) Bug Fix (04/26/17/MIW): Fillbar keyworks now match the data if they area spread over separate pages. (111) Bug Fix (04/21/17/MIW): The Header Legend that is linked to the Histogram now aligns correctly with the compiled log. (110) Bug Fix (04/21/17/MIW): The Edit and Static Note hborders now plot at the correct width. (109) Bug Fix (04/20/17/MIW): Fixed a small problem with the variable color bar graph text. (108) Bug Fix (04/20/17/MIW): The Edit and Static Note borders now plot at the correct width. (107) Bug Fix (04/20/17/MIW): Variable color Bar Graph Values were not being assigned to the default color when the value exceeded the maximum value. (106) Bug Fix (04/21/17/MIW): The Edit and Static Note hborders now plot at the correct width. (105) New Feature (04/12/17/MIW): A new item titled "Select & Edit" has been added to the popup menu that appears when the user right-clicks within the Log Designer. This provides a means to quickly select and edit an item from a list of entities within the log design. (104) Improvement (04/07/17/MIW): Values that are not within the Color Table for Bar Graph and Bar Graph Value columns now default to a single color value. (103) New Feature (04/07/17/MIW): It is now possible to center Bar Graph Value text. (102) Bug Fix (04/07/17/MIW): Exporting a template to Excel no longer skips empty data sheets. (101) Bug Fix (04/07/17/MIW): Exporting a template to Excel no longer fills-in the Edit-Text with default values. (100) Bug Fix (04/07/17/MIW): It is not possible to switch from logarithmic scaling within the Bar Graph design options dialog. (099) New Feature (04/05/17/MIW): The Header Legend for a Bar Graph that uses a Color Table now displays a simple graphic color bar. (098) Bug Fix (04/05/17/MIW): The Log Designer paste operation now correcly places items when the "receiving" portion of the now is not fully scrolled. (097) Bug Fix (04/05/17/MIW): Fracture line widths are now scaled properly for high-resolution output. (096) Bug Fix (04/05/17/MIW): Symbols within compiled logs are now stretched properly. (095) Bug Fix (04/05/17/MIW): Symbols within compiled logs are no longer drawn too large. (094) Bug Fix (04/05/17/MIW): Symbols within the header are no longer drawn too large. (093) Improvement (04/04/JCJ): When updating a Data Template from within the Log Designer, Bar Graph Value column will now create corresponding Interval Text columns. (092) Bug Fix (04/04/JCJ): Line breaks within LogPlot7 data files (i.e. "/*") will now import correctly into LogPlot8 (i.e. "<br>"). 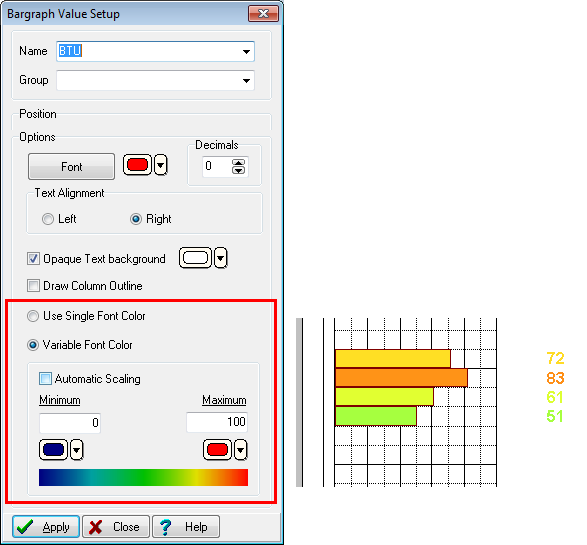 (091) New Feature (04/03/17/MIW): A Color Table option has been added to the Bargraph and Bargraph Value items. It uses a Color Table with the same entity name as the Bargraph or Bargraph value columns. (090) New Feature (03/31/07/MIW): It is now possible to vary the colors for Bargraph Text based on the bargraph value. The range can be calculated automatically or manually specified (min/max). (089) Bug Fix (03/31/07/MIW): The paste function within the LogDesigner now maintains the spatial relationship of items being pasted when the receiving panel is vertically scrolled. (088) Bug Fix (03/30/17/MIW): When using the LogView program, applying changes to a log compiled in centimeters no longer causes the pattern density to change. (087) New Feature (03/30/17/MIW): It is now possible to vary the colors for Bargraph Value labels based on the bargraph value. (086) Bug Fix (03/29/17/MIW): Value-based colors for Histograms and Histogram Legends are now plotted correctly. (085) Bug Fix (03/29/17/MIW): Pasting header and footer items within LogDesigner to a scrolled window now maintains the spatial relationship between items. (084) Bug Fix (03/16/17/MIW): Changing LogDesign files (*.LDFX8) from within the Compile dialog no longer causes an Access Violation error. (084) Bug Fix (03/13/17/MIW): Edit-Text within Log Designs that have a blank Group Name are now added to new data files. (083) Bug Fix (03/10/17/MIW): Outputting logs to printers, PDFs, or bitmaps no longer produces text that is longer than the screen display. (082) Bug Fix (03/10/17/MIW): Log Footers with a specified height no longer causes the program to incorrectly calculate the length of vertical lines. (081) Bug Fix (03/10/17/MIW): Vertical lines within printouts, PDFs, and bitmaps are no shown using the proper lengths. (080) Bug Fix (03/02/17/MIW): The 64-bit version is now able open the Symbol Picker dialog. (079) Bug Fix (03/02/17/MIW): The program no longer generates sporadic "Class TElPanel not found." errors. (078) Bug Fix (02/24/17/MIW): The Bar Graph Value labels are now plotted correctly within multi-page logs. (077) Bug Fix (02/09/17/JCJ): The AGS Import now accepts different decimal delimeters when the delimiter is not the same as the current local setting. (076) Bug Fix (02/01/17/MIW): Curve lines are now clipped when a fill has been selected. (075) Bug Fix (02/01/17/MIW): Comments within Lithology Descriptions are now plotted when the description within the LogDesign is set for keywords only. (074) Bug Fix (02/01/17/MIW): The Lithology Description Column now includes a base and top line if the Description dividers are disabled. (073) New Feature (01/30/17/MIW): It is now possible to plot wavy contact lines that separate lithologic patterns. (072) Improvement (01/26/17/MIW): An error message will now appearing during compilation if the combined header and footer length are longer than the page length. (071) Improvement (01/26/17/MIW): A warning will now be issued when saving the LogDesign if the Title Page is longer than the page length. (070) Bug Fix (01/23/17/MIW): The Header Legend now plots the matching line when matched with a Cross Plot. (069) Improvement (01/18/17/MIW): An error message (as opposed to a bug report) will now be displayed when compiling a log in which the combined height of the header, footer and margins is greater then the page length. (068) Improvement (01/18/17/MIW): A warning will now be displayed when saving a LogDesign in which the Title Page is longer then the page length. (067) Improvement (01/18/17/MIW): Pasting 1 or more items in a LogDesign panel that is scrolled now places the pasted items in a vertical position relative to the scroll bar. (066) Bug Fix (01/18/17/MIW): Loading a LogDesign file with a different set of units (inch/centimeter) then the previous LogDesign now updates the ruler units. (065) Bug Fix (01/16/17/MIW): Contact lines within the Lithology Pattern column now match the data. (064) Bug Fix (01/13/17/MIW): The Lithology Pattern and Well Construction columns now use the Keyword Border option when drawing the pattern borders. (063) Improvement (01/13/17/JCJ): The AGS Data Viewer now works in a non-modal fashion thereby allowing the user to view the data that is being imported. (062) Cosmetic (01/12/17/JCJ): Help links have been added for the AGS, DBF, Excel LAS and Text editor export programs. (061) Bug Fix (01/11/17/MIW): Bar Graph and Bar Graph Value columns now recognize data that includes thousand separators. (060) Bug Fix (01/11/17/MIW): Cross Plot High to Low and Low to High settings are now saved within the Log Designer. (059) Bug Fix (01/11/17/MIW): The Data Smoothing algorithm no longer causes an Index Out of Bounds error when high levels of smoothing are used. (058) New Feature (01/11/17/JCJ): Right-clicking the Project Manager will now manually refresh the listing. This is especially useful if the Project Folder monitoring has been disabled. (057) New Feature (01/11/17/JCJ): The Project Folder monitoring may now be disabled via the Options | System Settings menu. (056) Improvement (01/11/17/JCJ): The RockWorks export has been expanded to provided finer control over the process. Specifically if there are say more than one Water Levels or Well Construction Datasheet, you can pick which one is imported. Before the last one was imported and any other ones ignored. For Patterns/Symbols and Bitmaps you can select to include any or all of those Datasheets. A summary of what will be transferred has also been included. (055) Bug Fix (01/03/17/JCJ): Null (blank) Stratigraphy data imported from RockWorks Items is now imported correctly instead of converting the null items to zero. (054) New Feature (01/03/17/JCJ): The Help menu now includes an option to show the Revision List within a browser window. (053) Improvement (01/03/17/JCJ): Items selected from the Project drop-down list will now move that item to the top of the history list. (052) Bug Fix (12/28/16/MIW): Importing LogPlot7 data files without the optional column width information no loger causes the import to sporadically skip data sections. (051) Improvement (12/27/16/MIW): The raster export dialog has been redesigned to be less confusing. (050) Bug Fix (12/27/16/MIW): Page sizing for one-page raster exports has been fixed for both inch and centimeter scaling. (049) Bug Fix (12/21/16/MIW): The line break tag (<br>) within the textual descriptions is now recognized correctly if the BR is in upper-case. (048) Improvement (12/20/16/JCJ): The bug report header now specifies the version (32 or 64-bit). (047) Bug Fix (12/19/16/MIW): Huge raster exports (PNG, JPG, TIF, and BMP) from the LogView program no longer fail. (046) Bug Fix (12/16/16/MIW): The Value Based Color (continuous) now extends to the full range of colors. (045) Improvement (12/16/16/MIW): Symbols without a specified size are now drawn to the borders of the column. (044) Bug Fix (12/16/16/MIW): The bottom of Vertical Scrollbars in the LogDesigner is no longer sporadically hidden on start up. (043) Bug Fix (12/16/16/MIW): The Snap Grid no longer gives an Out of Memory error with very large page sizes. (042) Bug Fix (12/14/16/MIW): Older LogPlot8 files are now properly embedding their properties. (041) New Feature (12/14/16/JCJ): LogPlot8 line types (e.g. wavy lines) for lithology and stratigraphy contacts are now exported to the RockWorks17 lithology and stratigraphy tables. (040) New Feature (12/14/16/MIW): An option has been added for embedding system files (Keyword, Pattern and Symbol) within the compiled log (lpt8). The files with embedded system files are approximately 300k larter that files without the embedding. (039) Improvement (12/12/16/MIW): The Embed option can now be accessed from the System Options and Compile Options dialogs. (038) Improvement (12/08/16/MIW): Point or Interval Symbol data with an undefined size parameter now defaults to the width ot the column. (037) Bug Fix (12/08/16/MIW): Continuous color-fills within Curves and Bar Graphs are now plotted correctly when ranging from a dark to a lighter shade of a single color. (036) Cosmetic (12/07/16/MIW): The size of the About window has been increased such that the text within the number of days until the maintenance expiration is fully displayed. (035) Bug Fix (12/07/16/MIW): The correct page numbers are now displayed when exporting to PDFs, bitmaps, or printing. (034) Cosmetic (12/06/16/JCJ): Errors that occurred when saving a design file are now trapped and reported instead of generating a bug report. (033) Cosmetic (12/05/16/MIW): The icon for the 64-bit version is now blue . (032) Bug Fix (12/01/16/MIW): The text within Text Columns (point) are now wrapped and displayed correctly. (031) Bug Fix (12/01/16/JCJ): Non-US formatted numbers are now handled correctly. (030) Bug Fix (11/21/16/MIW): Exports from LogView (PNG, PDF, JPG, etc.) no longer sporadically cut off Point Text near the base of the page. (029) Bug Fix (11/18/16/MIW): Memory leaks no longer occur and cause errors when exporting to a PDF file. (028) Bug Fix (11/18/16/MIW): An Access Violation error no longer occurs when saving compiled logs with a Lithology Profile. (027) Bug Fix (11/17/16/MIW): Lithology descriptions with intervals that are plotted on three or more pages no longer sporadically plot within the header. (026) Bug Fix (11/17/16/MIW): The batch PDF processing now works correctly. (025) Enhancement (11/17/16/MIW): The Batch Editor now "remembers" the last PDF output DPI that was selected. (024) Bug Fix (11/10/16/MIW): The Bug Report now shows the correct executable date. (023) Bug Fix (11/10/16/MIW): Compiled logs are now correctly loaded from the command line. (022) Bug Fix (11/10/16/MIW): The margin between the header/footer and the log body is now correctly sized when set to centimeters. (021) Improvement (11/10/16/MIW): The LogView drawing is now "double-buffered" which eliminates flickering and artifacts that are left behind when rapidly scrolling. (020) New Feature (11/07/16/MIW): A new option has been added for including trailing zeroes (e.g. 10.00000 versus 10) within the Lithology Description interval and thickness values. (019) Bug Fix (11/07/16/MIW): Line thicknesses within compiled logs are now consistent with the exported and printed diagrams. (018) Bug Fix (11/07/16/MIW): The Scalebar dialog within the LogDesigner now shows the correct coordinates when set to centimeters. (017) Bug Fix (11/07/16/MIW): Eastings and Northings are now saved within Compiled Logs, Exports and Printing when Static Text macros are used. (016) Bug Fix (11/07/16/MIW): Unrecognized pages within multi-sheet Excel Imports no longer cause an error. Instead, the user is now given the option to Skip or Abort. 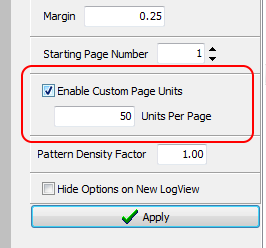 (015) New Feature (11/04/16/MIW): It is now possible to specify a range of pages when exporting from LogView to PDF. (014) Bug Fix (11/04/16/MIW): Descriptions now plot correctly when they overlap the top or bottom of a page break. (013) Bug Fix (11/04/16/MIW): The single depth symbol is now sized correctly. (012) Bug Fix (11/03/16/MIW): The Compile All Logs program now uses the correct starting and ending depths. (011) Improvement (11/02/16/MIW): Data grid row heights are modified dynamically to better show formatted text with super/subscript text. (010) Improvement (11/02/16/MIW): Pattern background fills are no longer "painted" if the background color is white to allow for transparency. (009) Bug Fix (11/02/16/MIW): Reserved HTML characters are now replaced when pasting text from another source into formatted text fields within the Data Editor. (008) New Feature (10/31/16/JCJ): Downloadable Help has been added to the Settings menu. (007) Bug Fix (10/31/16/MIW): Text anti-aliasing has been disabled because it creates inconsistent appearing text. (006) Bug Fix (10/31/16/MIW): Edit-Text no longer plots the default text if the text in the spreadsheet is empty. (005) Bug Fix (10/31/16/MIW): Symbol sizes and stretching are now honored. (004) Bug Fix (10/27/16/MIW): The Compile | All Open Logs command method no longer deletes all the items within the LogDesigner. (003) Bug Fix (10/26/16/MIW): Scale tables from LogPlot7 data files are now imported correctly. (002) New Feature (10/26/16/MIW): The raster exports (PNG, JPG, BMP, & TIFF) now include an option for exporting just the current page. (001) Initial Release (10/24/16/MMM): LogPlot8 is now available! Check out the What's New video for a tour of the new features and improvements. Download the LogPlot8 demo and give it a spin!